I personally love cakes! I won't say all kinds of cake, but most kinds of cake. Beautifully frosted and decorated cakes always mesmerize me. They're like stunning works of art for me. But back when I was a little girl, there's this cake that I really like. It's not fancy...it's not tall...it doesn't even have frosting...but my birthdays wouldn't be complete without it even if I have a beautiful store bought cake. I'm talking about the famous Refrigerator Cake.Before my mom got her wonder oven (which she used to bake her delicious cakes), refrigerator cake was the only cake she could make. She used to make it with broas (ladyfingers) with mango topping. My birthdays won't be complete without it and a store bought chocolate or chiffon cake with butter cream icing. When I was in college, I started making ref cake on my own and I found out that honey graham crackers work better on it. So that's what I've been using since then. I've tried different toppings aside from mango like canned peaches, fruit cocktail, sweetened strawberries and coarsely chopped Oreo but I liked mango and canned peaches the best. The only drawback with mango is that the taste changes after a couple of days, so I used canned peaches more often. It is such a delicious and easy dessert. It only requires a few ingredients, and it doesn't even involve turning on the oven. What more could you ask for???! 1. 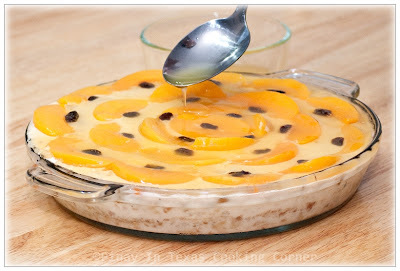 In a bowl, mix table cream & condensed milk thoroughly. 2. 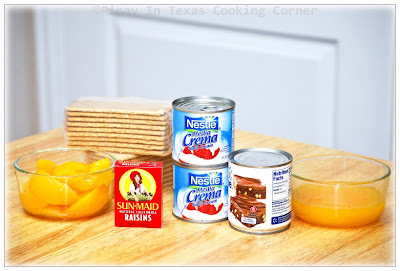 Spread about 6 Tbsp of the mixture on a 9.5" round dish, arrange a layer of graham crackers on top of it (you might want to crumb the graham crackers to fill uneven spaces), then make another layer of the cream & condensed milk mixture, then another layer of graham crackers and so on until you have made 4 layers of each, the cream and milk mixture being the top layer. Arrange the peach & raisins however you want it. Put in freezer for about 15-20 minutes. 3. Meanwhile, cook the gelatin according to package directions. Allow to cool down and then using a spoon, gently pour over on top of the cake until fully covered. 4. Chill for at least 3 hours before serving. Best if chilled overnight. Slice and serve. Hi Tina, finally I mange to put a comment. I'd been trying several attempt, it comes out message service error. Anyway your peach looks extremely good and tempting. Love the peach decoration, very beautiful. Yummy...my hubby luvs this...will be doing this over the weekend. Tks for sharing! So lovely and seems easy! I will be making this very soon. It seems like there are many variations one could make. Peaches cream and graham crackers-yum! Your mom sure was creative when there was no oven and by the looks of this, I do not think that it was even missed. Delicious post and I love how the top looks like a flower. Well done! I don't love cakes but can't stop admiring all the lovely cakes others make. You know I don't fancy anything sweet and its a small bite treat for me. I do salute people like you who can come out with such gorgeous cake and actually given a choice, I will for the mangoes. How nice you have shared a cake that does not need baking and simple to follow. I need more of these type of cake recipes because I freak out with the ones which are elaborate and takes really skills to bake. Nice deco and lovely contrast of colors. I love how simple this is! Refrigerator cakes are truly a wonder. They are SO incredibly delicious, and yet they're half the work of a traditional baked cake. Beautiful recipe! I think your cake Tina look pretty fancy..and to tell you the truth I would rather have piece of your cake than any loaded with frosting! Beautifully done..very delicious too!!! Have a lovely day sweetie!!!! I've never heard of a refrigerator cake before! How awesome is this! It looks so easy and so delish! Wow, Tina! :-) The presentation is very attractive too. Nice one! even if it's snowing here, you refregerator cake appeals to me like in a hot summer day. i want to try this with mangoes too! thank you for letting me know about my feature on foodbuzz fb! i was totally clueless! I have *never* heard of this before, but it is so beautiful that it's going on my "must try" list! Tina, love this recipe...like the idea that you can prepare in advance and leave it in the fridge...looks very refreshing. 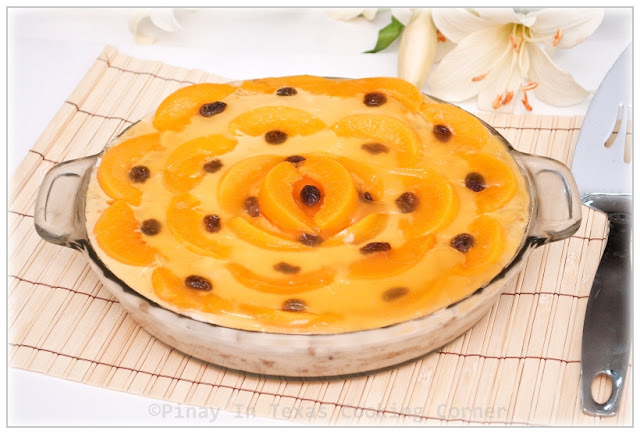 Pagbati Tina, nice and easy to prepare your peach cake. I'll try it. If you like cooking please visit my blog at http://cooking-engineer.blogspot.com/ where you can find Malaysian dishes recipes. Please follow my blog. Salamat. How creative people can get when need be. This is so great! I really need to try this one out! 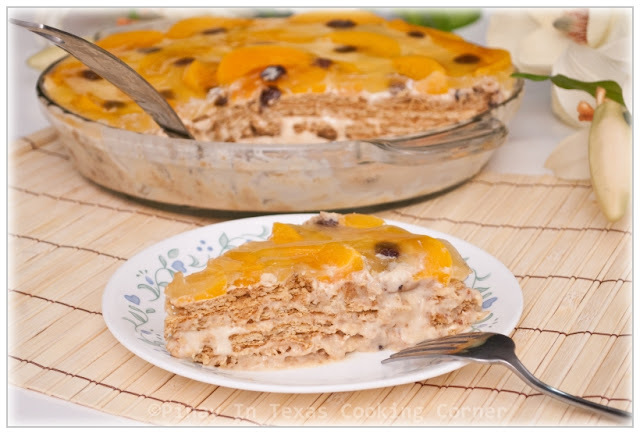 Oh, I love peach desserts and this sounds so fabulous with the layers of cream and graham crackers! How yummy! What a unique and absolutely delicious looking peach pie/cake! I love the layering of the graham crackers and filling and then anything with peaches has got to be good! Beautiful cake! Ohhh the cake looks yummy and pretty , too ! Oh this is gorgeous. Peach is the love of my life. This is stunning. It's amazing that this cake is a refrigerator-made cake. It looks scrumptious. Buzzed you! No bake cake whoo hoo! Thanks for sharing your special cake with us. You decorate the cake really beautifully (so as other cakes!). I don't know if I'm patient enough to make dessert sometimes. How delicious! Have a great weekend Tina! I love peaches! This cake looks amazing! 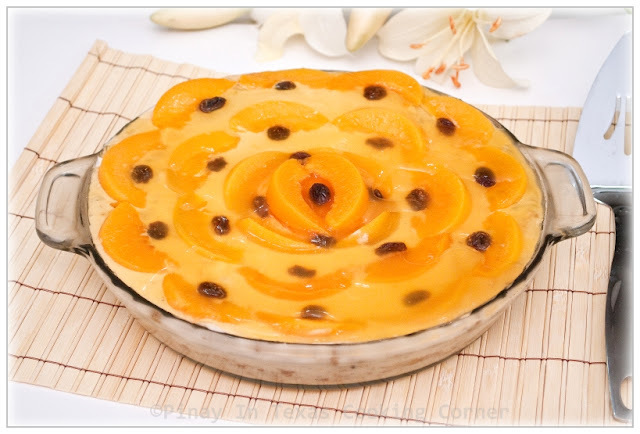 Who knew a refrigerator cake could be so beautiful! looks great - I will definitely try this! I am about to make this delicious dessert but I do not see any mention of the peach syrup anywhere on steps 1-4. Please advise. thx. Hi! As I mentioned in the ingredients list, the peach syrup is for making the gelatin. Sorry for not elaborating it in step 3 where I only said "cook the gelatin according to package directions". If you are using Knox gelatine, here's how you'll do it: 1.Heat up 1/2 cup of the peach syrup in the microwave for a minute. 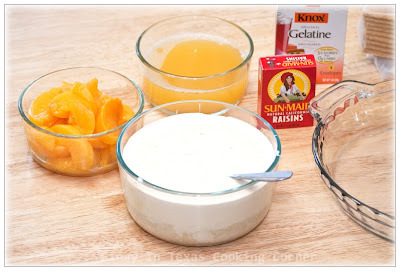 2.Sprinkle gelatin over the other 1/2 cup of the peach syrup and let stand in 1 minute. 3.Add hot peach syrup and stir until gelatin completely dissolves.